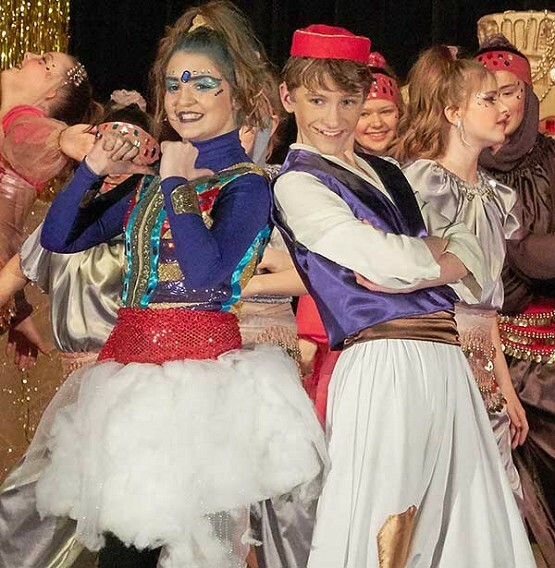 Clara Christensen and Rogan deCalesta portray Genie and Aladdin in the March performance for O’Hara. 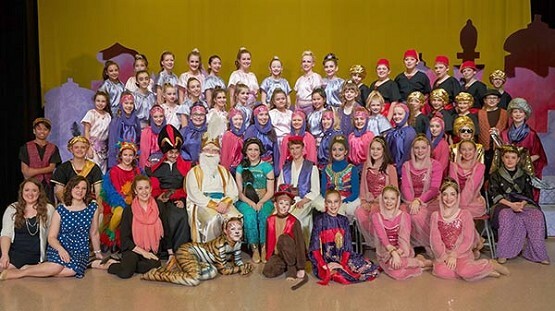 More than 90 students contributed to Eugene’s O’Hara Catholic School presention “Aladdin, Jr.” in March. The performance marked the fifth year of the school’s drama program. EUGENE — For three nights in March, the crowd in the gymnasium at O'Hara Catholic School was transported to Agrabah, the fictitious kingdom in the story of “Aladdin.” Co-Directed by Kathryn Leonard, O'Hara's music specialist, and Paige Showalter, O'Hara's 4th through 8th grade Spanish specialist, the play was attended by more than 350 people each night. More than 90 students in grades five through eight made up the cast and crew in the fifth year of the school's drama program. The event was free of charge and open to the community. In lieu of ticket sales, O'Hara relies on concession sales, a pass-the-hat donation opportunity and the sales of CandyGrams and Bravos (two types of congratulatory notes for actors) as sources of revenue. These revenue sources totaled $3,348 in 2017. Past O'Hara drama productions include Beauty and the Beast (2013), The Sound of Music (2014), Peter Pan (2015), and Annie (2016). Keeping with tradition, O'Hara's 2018 production was announced on the final night of this year's performances; O'Hara will present The Fiddler on the Roof in March 2018.